At the origin, the chromatographic analysis has been developed as a direct method, allowing the separation, the quantification and the identification of the components of a complex mix. This was achieved, in particular, thanks to the works of James and Martin (1956) with the development of the gas/liquid partition chromatography. Soon after their discovery, the same authors have proposed to use this technique to determine the thermodynamic properties of a melted polymer impregnated on a finely divided solid (powder). This is the founding idea of the principle of inverse gas chromatography today called IGC. Inverse Chromatography is designed to mesure physicochemical properties of materials and surfaces. Figure illustrates the fundamental difference between classical GC and IGC. The above figure illustrates the fundamental difference between classical GC and IGC. The two analytical methods are distinguished by the object of the study: on the left, the blend to analyse, on the right, the solid contained into the column. In order to perform such determinations, the role of the mobile and of the stationary phase are inversed. Here it is the stationary phase that is analysed. This implies to fill a column with the material to be characterized. Hence, the first step of an IGC analysis is the filling of the column with the solid of interest. This is also the first critical point. The technique to fill columns with ideal powders having monodisperse granular size, i.e. similar to standard chromatographic stationary phase like Chromosorb®, is well known. But, Inverse Chromatography often deals with very divided solids, having a mean particle diameter of few microns (fillers for polymers like talc, silica or carbon black) or with fibres (textile fibres or hairs, for example). Of course, each type of solid is a particular case, requiring an adapted filling protocol. Our experience, acquired through thousands analyses, allows us to find quickly a satisfactory protocol, which respects the surface state of the analysed solid. The Inverse Chromatography Techniques could be shared into two groups depending on the applied mobile phase. Indeed, the latter can be liquid or gaseous. If the mobile phase is liquid (solvent), we are performing Inverse Liquid Chromatography (ILC). When using a gaseous carrier phase, the technique is called Inverse Gas Chromatography (IGC). The ILC or IGC measurements are realized by injecting chosen and known molecules, called molecular probes, in order to get chromatograms. Obviously, the measured retention times, as well as the shape of the obtained peaks, are depending on the interactions occurring between the molecular probes and the investigated material (stationary phase). Therefore, the exploitation of measured retention times and/or of the shape of the chromatograms gives access to numerous physicochemical properties of the analysed materials. The IGC at infinite dilution (IGC-ID) method is so called because very low amounts of molecular probes are injected. In such situation, the interactions between the molecular probes are negligible and the retention time is only depending on the interactions occurring with the investigated stationary phase. IGC-ID is applied to characterise the properties of solid surfaces but also to determine transition temperatures and characterize liquids (ex. molten polymers) for the determination of solubility parameters. The IGC at finite concentration (IGC-FC) method consists of injecting a more important molecular probe amount. The reached surface coverage ratios are close to the monolayer or even higher. This method is applied mainly in gas/solid chromatography with the goal to determine desorption isotherms, specific surface area and measuring the surface heterogeneity. The Inverse Chromatography techniques are powerful tools for the R&D departments and Quality control. The application fields are wide and numerous physicochemical properties are measurable. 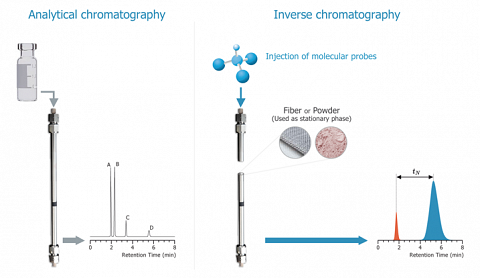 Inverse Chromatography measures the interaction potential of the materials and of their surfaces. But, the more important point is that Inverse Chromatography measures the interaction ability of the investigated materials. In that way, these techniques are complementary to spectroscopy and microscopy. Spectroscopy informs about the chemical composition, Microscopy informs about the surface texture and the morphology. Inverse Chromatography delivers how chemistry and morphology act together on the interaction potential and the physicochemical properties of the material.